NOTE: I received an ARC of this book via Penguin Random House’s First To Read in order to provide an honest review. I was not required to write a positive review. All opinions contained herein are my own. 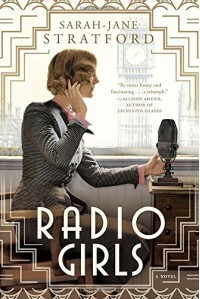 Radio Girls is a remarkable, captivating, and powerful story about determined, courageous,resilient women at the BBC during the turbulent years between WWI and WWII. Sarah-Jane Stratford magnificently intertwined history and fiction flawlessly in this most intriguing, captivating, biographical historical novel. While this story follows the fictional character of Maisie, it is also a factual account of the life of one of Briton’s most influential woman, Hilda Matheson. Hilda's intelligence and perception transformed the airwaves as BBC's first Director of Talks enlightening and self-assuring the women of her time. The story started out slow, but it was needed so one would know the backgrounds of both the real and fictional characters and how they fit together. It didn't take long before the story took off sweeping me back in time to the 1920s with intrigue and drama and it never lets go. I was drawn into the story as though I was one of the girls working right along with Maisie and Hilda in the Talks department. I wish it never had to come to an end. Radio Girls as a whole was a fascinating look into the BBC during 1920s London which fully captivated me from beginning to end. I absolutely highly recommend this first-rate invigorating story.